Last year, Celia (my only not-homeschooler) was accepted into her school's advanced math program. It was a steep learning curve for her, because the program zoomed through both fifth and sixth grade math in a single year. There were times I thought her head was really going to start spinning, and was concerned a "summer slide" would make this fall that much harder. She also learned she's going to have a new teacher, so on top of it all, will need to adjust to a different teaching style. When UnLock Math offered us the opportunity to work with their program UnLock Pre-Algebra, I thought it would be a great chance for her to work over the summer. Since Pre-Algebra is usually a 7th or 8th grade math, I thought it would give her some exposure to what is in her near future, while allowing her to work at her own pace. My hope was that by the time she's back in school she'd be familiar with the new information so it would be less of an adjustment. 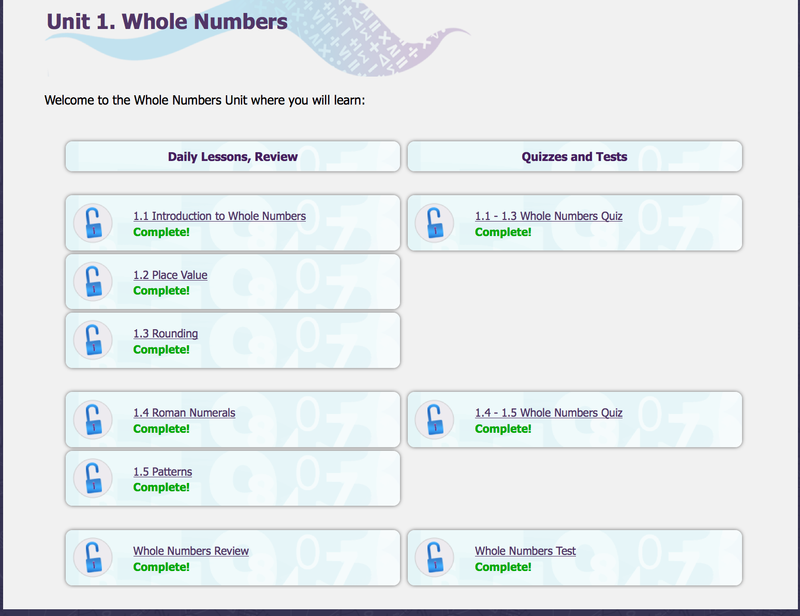 I am unapologetic about not being a higher maths person, so in order for this to happen, I needed something that was as close to self-contained as possible. I expected I may need to do some worksheet marking, with UnLock Pre-Algebra, the entire program is organized so all that a parent needs to do is sign up. Teaching, testing, and grading all are done for you. I'm liking this so far. Each unit is divided into several sections (how many depends on the amount of content contained within). After every other chapter, there is a quiz on the material from the past two units. 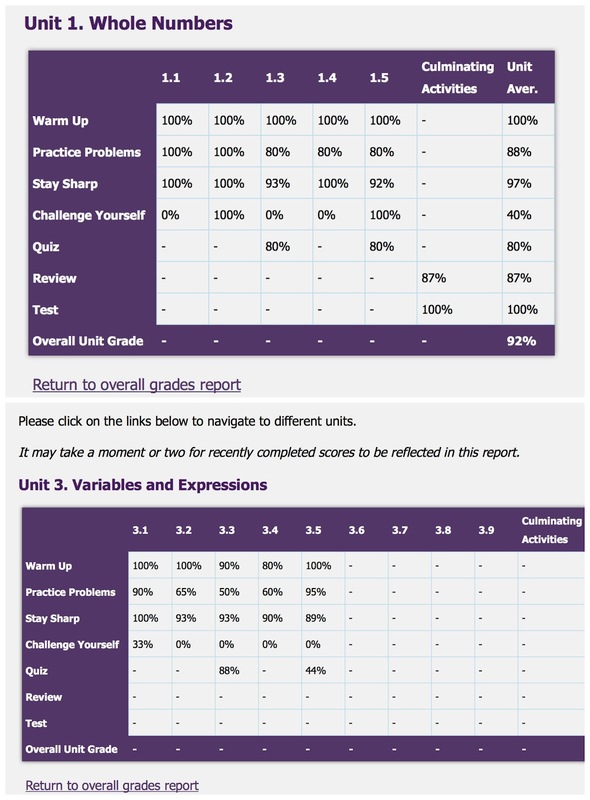 I like how the program doesn't wait until the end of the section to check how the student is faring, but rather these more frequent spot checks let me know how Celia is doing before she is totally overwhelmed. -Reference Notes* (printable notes for the lesson). *Note: these are optional and not something we used, but would be good for a student who prefers to have written notes to refer back to while working. The biggest problems we had were a lot of glitches when she went to complete tasks. I'm not certain if it was our internet, our browser (she was using Safari), or what, but often the program timed out before getting to the next thing. For most tasks, the students are allowed one re-do, so most of the time she just did the second chance and it was fine. However, for the Quiz and Challenge sections, only one attempt is permitted, and if it timed out, she was out of luck. Since this isn't counting as her official grade, I'm not stressing over. She is, though, because it's a lot of zeroes. With those grades, she has an 88 average through 3 1/2 units, which is still pretty respectable. However, without those zeroes, she is carrying a 95. That's a big hit to her grade with a computer glitch. (I've spoken to a few other crew members, and it seems that they haven't had the same issues, but use a different browser, so we're going to try to use something other than Safari. I'll let you know how it goes.) I've sat with her and watched her work the problems, so I know that she understands what's being taught; it's definitely the computer not wanting to cooperate. When I'm the teacher, as I am for the boys, I can tell where a program is going to fit with their knowledge; I know exactly where they have left off, and what they know well or struggle with. It's a little different for Celia, because that has been delegated to the school. Generally, I know what she's doing, and how well she is working with material, but I don't become over-involved with the details of her curriculum. (If I felt I needed to micromanage it, I certainly wouldn't be paying tuition for her to go to school.) So far, she's completed the first three chapters and said nearly all of it has been review. It's been presented a little differently, but all of the terms and exercises are things she's familiar with, so this has turned out to be a review for her so far. Looking ahead to some of the later chapters, she thinks some of them will be new. She's looking forward to working on those. She's solidified what she knows from before, which will put her in good stead going forward. When I asked her what she thought of the program, her response was, "I can't wait to do math again tomorrow, this is the best Math program ever!" I'm not sure I'd agree that it's the best math program ever, but any program that makes her want to do more math in the middle of summer break rates pretty high in my book. 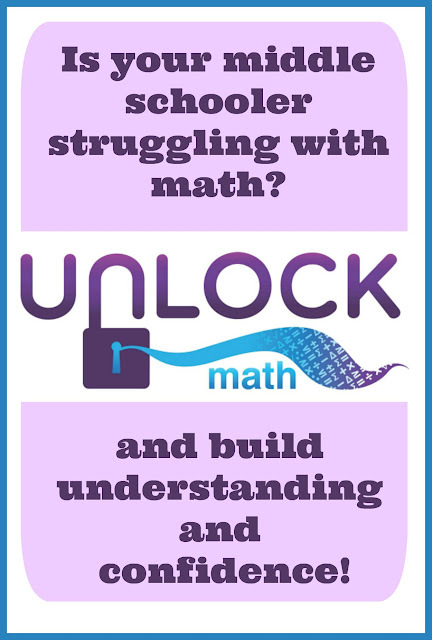 Follow UnLock Math on social media, or click the banner below to read more reviews.